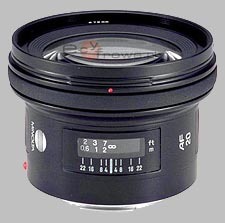 (From Konica Minolta lens literature) This ultra-wideangle lens has a rear-focusing floating optical system that ensures quick, precise autofocusing and virtually eliminates close-focus aberrations. Its seven-blade aperture produces a circular opening to provide round, natural background highlights. It's wide, it's small and it produces very good images. For the price on the used market, it is an excellent value. Minimum distortions and vignette. Recommended. I sold the Sigma 20/1.8 and kept this one, primarily because of the size/weight difference, although it was a pretty decent performer too.